Another meaningful message gone bad. This sorry scribble is supposed to say "beloved son", but it does not. Still, it's not just meaningless babble as some Hebrew Tattoos end up, this one actually has a meaning, it says "Only Friend". It reads "Ydid Yachid". Honestly, I've no idea where he pulled that one from... But I'll have to guess it came from a well meaning but Hebrew illiterate Jewish friend, the kind that picked up some Hebrew at the local temple. Do YOU have one of those? Don't let him translate your tattoo. Okay, for today's lesson we'll learn to write "Beloved Son" for real. 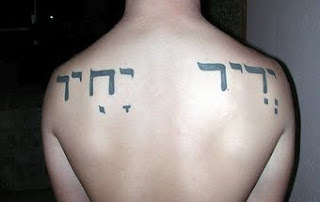 It reads "Ben Ahuv", no resemble whatsoever to the "Ydid Yachid" of our victim above. 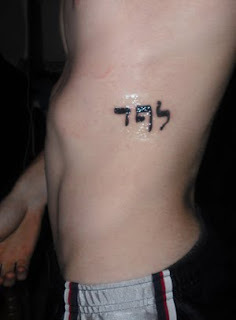 Question: Is it possible to mess up an initials Hebrew Tattoo? This guy didn't ask for much, just to have a tattoo with some nifty initials. Unfortunately he didn't bother getting his Hebrew letters right. See, in the Hebrew language, some letters have a special "ending" form. You only ever use those "ending" letters at the end of the word. Now, take a wild guess as to which of the letters above is in its "ending" form? 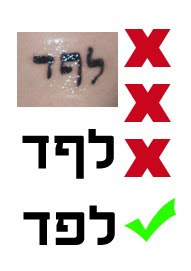 The letters on the tattoo (from right to left) are: Lamed, Pe, Dalet. Now, observe the diagram above. Beside having the "ending" Pe instead of the regular one, this tattoo also suffers from random scaling. Correctly written, the Dalet and Pe are the supposed to have the same height, while the Lamed sticks above a bit. The "ending" Pe on the other hand, has a longish bit that sticks below the level of other letters. The carelessness of this piece's designer actually makes it easy to fix. All that need be done is adding a line at the bottom of the Pe and making the Dalet longer. Such an easy fix wouldn't be possible had the letters been correctly scaled and arranged, so, Initial Guy, consider yourself lucky!